LibreOffice 5.0 was released last week and it includes numerous changes, such as UI improvements, better HiDPI support, new icon theme by KDE called Breeze, much improved Spreadsheet, better filters for documents and more. For a complete list of changes, see THIS page. According to the Document Foundation blog, the latest LibreOffice 5.0 is the "cornerstone of the mobile clients on Android and Ubuntu Touch, as well as the upcoming cloud version". 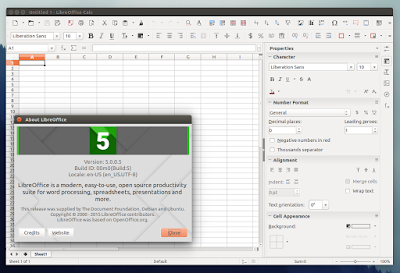 In Ubuntu, Linux Mint and derivatives, the latest LibreOffice 5.0 (Fresh) can be installed either by using a PPA or by downloading and installing the official LibreOffice debs. Installing LibreOffice via PPA and not by using the official *.deb files is the recommended way of installing/upgrading LibreOffice in Ubuntu (as stated here) because the .deb files provided by The Document Foundation are intentionally built against a very old baseline for maximum compatibility. Furthermore, by using the PPA, you can automatically get updates as well as easily go back to the LibreOffice version available in the official Ubuntu repositories if for some reason you're not satisfied with the new release, by using PPA Purge. Below you'll find instructions on how to install LibreOffice in Ubuntu or Linux Mint via PPA as well as how to purge the PPA in case you want to go back to the LibreOffice version you were using before adding this PPA. Important: There are two PPAs you can use to install LibreOffice 5.0 in Ubuntu and Linux Mint: the LibreOffice Fresh PPA which provides the latest stable LibreOffice Fresh (so for instance when LibreOffice 5.1 comes out, this PPA will be updated with LibreOffice 5.1) and the LibreOffice 5.0.x PPA (which I've used for the instructions below) which only provides LibreOffice 5.0.x updates. Right now, both PPAs provide the same LibreOffice version. If you prefer to use the LibreOffice Fresh PPA, replace "ppa:libreoffice/libreoffice-5-0" in the commands below with "ppa:libreoffice/ppa". At the time I'm writing this article, the LibreOffice 5.0.x PPA provides LibreOffice 5.0.0 RC5 which is identical to the final release. Then save the file and continue with the instructions below. To change the icon theme in LibreOffice, go to Tools > Options > LibreOffice > View and set the icon style to Breeze.